Called the “Father of Impressionism,” Johan Jongkind produced over 900 paintings, 4000 watercolors, and 20 etchings during his prolific but troubled career. His formal art education began at the Academie voor Beeldende Kunsten in the Hague in 1836, where he studied with the well-known landscape painter Andreas Schelfhout (1797-1870). Works from this period reveal Jongkind’s appreciation of the artists of the Dutch Golden Age: his scenes of windmills, winter ice skaters, and harbors filled with boats recall the pictures of Aelbert Cuyp (1620-1691), Jacob van Ruisdael (ca. 1629-1682), and Meindert Hobbema (1638-1709) in their subject matter and style. (The strong diagonals and dramatic perspectival views of Jongkind’s works, and the disproportionate ratio of ground to clouds and sky, derive from these 17th century masters, and would remain among the most distinctive features of his art.) 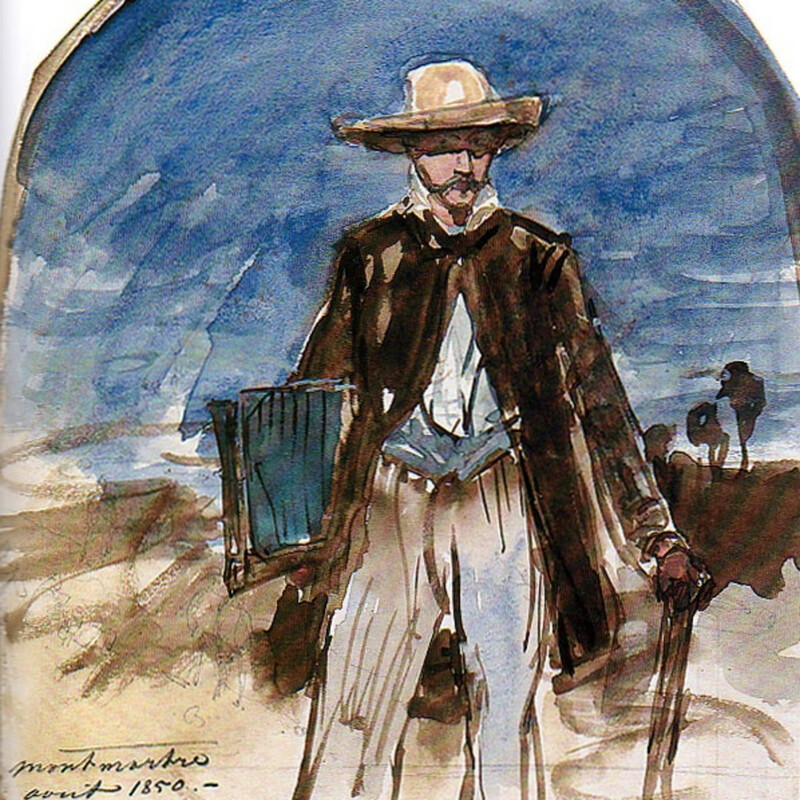 Jongkind’s short, rapid-fire brushstrokes and attention to the transitory effects of sunlight and shadow, highly original aspects of his paintings that were just beginning to emerge in the late 1830s and early 1840s, would prove profoundly influential for an entire generation of Impressionist painters, culminating in the works of Claude Monet (1840-1926). In 1844, Jongkind arrived in Paris to study with Eugène Isabey (1803-1886), and to establish his reputation in the French art world. Four years later, he began to show at the Paris Salons, choosing to exhibit his works in the sections devoted to French artists, rather than continue to acknowledge his Dutch past. Despite the support and promotional efforts of Adolphe Beugneit (1821-1893), Pierre-Firmin Martin (1817-1891), and Paul Durand-Ruel (1831-1922), the leading dealers in Paris at the time, and the popularity of his pictures among his artist-friends, Jongkind’s increasingly avant-garde style caused controversy among the critics, leading to periods of financial difficulty, alcoholism, and intense self-doubt. Unable to overcome his professional and personal frustrations, and feeling the first effects of the mental instability that would mark his adult life, he returned to Holland in 1854. By 1864, Jongkind and Monet were sketching together in the old harbor town of Honfleur. Jongkind’s practice of executing fluid watercolor and oil sketches en plein air, to be used toward his studio paintings, deeply impressed Monet, as well as their mutual friends Eugène Boudin (1824-1898) and Camille Pissarro (1830-1903). (Pissarro would, in fact, adopt this same artistic process.) Also influential was Jongkind’s method of painting the same scene at different times of the day or under different atmospheric conditions, an idea that Monet would develop most fully in his series of works depicting iconic settings and familiar sights, including Rouen Cathedral and stacks of drying wheat, barley, and oats. (For a striking example of Jongkind’s own “series” paintings, see Street Scene in Paris in Winter: Rue Notre-Dame-des-Champs, currently in the Gallery 19c inventory.) On September 16, 1864, both artists painted La Chapelle Notre-Dame-de-Grâce in Honfleur from identical vantage points; it was the confirmation of a mutually inspiring artistic dialogue that would endure throughout Jongkind’s career. Monet’s admiration did little to change critics’ tone, however, or to ease Jongkind’s difficulties with the Paris Salon. Rejected again in 1873, Jongkind determined to abandon that venue for good. Traveling in the 1880s throughout southern France and the Côte d’Azur, and only wintering in Paris, Jongkind focused his attention on his watercolors and on landscapes far removed from the city’s urban environs. Between 1878 and 1891, accompanied by Joséphine, Jongkind took up residence near Grenoble in La Côte-Saint-André. Happily, these years saw an increase in picture sales and a welcome respite from rejection and debt. In January 1891, however, Jongkind descended more deeply into alcohol and illness; he was subsequently admitted to a psychiatric hospital in Saint-Egrève. His rapid decline at this institution – he died in February of that year – was matched by the fast fading of his name from the popular imagination. It was not until the summer of 2004 that a French museum held a major retrospective of Jongkind’s work, rightfully restoring his name to the nineteenth-century canon. “Il fut à partir de ce moment mon vrai maître, et c’est à lui que je dus l’éducation definitive de mon oeil,” quoted in François Thiébault-Sisson, “Claude Monet, an Interview,” Le Temps, Paris, November 27, 1900, p. 3. Jongkind’s own influences at this time included Richard Parkes Bonington (1802-1828) and Jean-Baptiste-Camille Corot (1796-1875). His associations with the Barbizon school and painters in Le Havre, where he would eventually spend part of each year, were also profoundly impactful. Jongkind exhibited works in 1848, 1850, 1852, 1853, 1855, 1864, 1865, 1866, 1867, 1868, 1869, 1870, and 1872. Martin was widely known as “Père Martin” due to his ardent support of French artists, including Boudin, Jean-François Millet (1814-1875), Monet, Pissarro, Henri Rousseau (1844-1910), and Alfred Sisley (1839-1899). The sale took place on April, 7, 1860, at the Hôtel Drouot in Paris. 86 artists and collectors contributed, and over 6000 francs was raised. Among the founding members were Corot, Daubigny, Alphonse Legros (1837-1911), Millet, James Abbott McNeill Whistler (1834-1903), and Manet. Monet had just returned from military service in Algeria. “Sa peinture était trop nouvelle et d’une note bien trop artistique pour qu’on l’appréciat, en 1862, à son prix. Nul, aussi, ne savait moins se faire valoir. C’était un brave homme tout simple, écorchant abominablement le français, très timide. Il fut très expansif ce jour-là. Il se fit montrer mes esquisses, m’invita à venir travailler avec lui, m’expliqua le comment et le prouquoi de sa manieère et complete par la l’enseignement que j’avais déja reçu de Boudin. Il fut à partir de ce moment mon vrai maître, et c’est à lui que je dus l’éducation definitive de mon oeil,” quoted in Thiébault-Sisson, p. 3. Émile Zola (1840-1902) also found much to admire: “[Jongkind’s watercolors] give the idea of sketches dashed off in a few hours, for fear of letting the first impression escape. The truth is that the artist works his canvases at length, to arrive at this extreme simplicity and unheard-of finesse; everything happens in his eye, in his hand.” [“On dirait des ébauches jetées en quelques heures, par crainte de laisser échapper l'impression première. La vérité est que l'artiste travaille longuement ses toiles, pour arriver à cette extrême simplicité et à cette finesse inouïe ; tout se passe dans son oeil, dans sa main.”] Émile Zola, “Jongkind,” Lettres parisiennes, published in La Cloche, January 24, 1872, n. p.
 See Camille Pissarro to Paul Signac, letter of August 29, 1888, published in Georges Besson, Signac: Dessins, Paris, , p. 8; and Georges Lecomte, preface to Exposition Camille Pissarro, Galerie Durand-Ruel, Paris, February 1892, p. 8. Signac (1863-1935) would go on to write a laudatory book about Jongkind in 1927. Around this same time, Jongkind met Frédéric Bazille (1841-1870), Boudin, Corot, Gustave Courbet (1819-1877), Daubigny, Narcisse Virgilio Diaz (1807-1876), Sisley, Constant Troyon (1810-1865) and other prominent painters who gathered at the famous Farm Saint-Siméon, an inn and informal art colony in Honfleur run by Mère Toutain. An auction on April 12-14, 1883 at the Hôtel Drouot of 83 paintings and 21 watercolors by Jongkind was a major success. This was the Musée d’Orsay.